Orchestra, Virtual Orchestral Instrument from Synful. It includes a new French Horn which Synful says is an important step in the evolution of its RPM technology. Synful produces natural slurs, attacks, and varying note shapes automatically. Solo horn or sections can count 2 to 16 players. The product is designed to enable continuous change from a very dark sound to an extremely brassy sound. 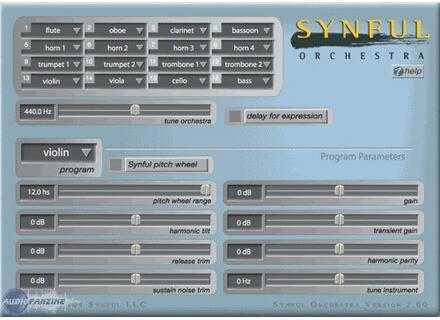 The French Horn is described by Synful as "the first fully expressive instrument to use Synful's 2nd generation RPM Synful synthesis engine. It does not use Delay for Expression. Everything you play live is the final product." It is based on 24 bit recordings which have been translated to an additive synthesis format. Control of timbre from darkest to most brassy. Phrasing using only note-on/note-off and velocity. No Delay for Expression for the new French Horn. Gliss and rip effects with control of gliss rate. Open sound, two different mutes, stopped sound. Wah control for mute and stopped sounds. MIDI "All Notes off Message" now works. Fixed bug causing Synful Orchestra to crash under Windows Finale. Fixed problem with Authorization panel not appearing on some Windows machines. Audiffex Updates inTone to v1.1.3 Audiffex has updated the Windows versions of inTone, Bass Pro, Guitar Pro, Keys Pro and Matrix Pro to v1.1.3. Cakewalk Sonar 8 Trial Version Cakewalk has announced availability of a free demonstration version of SONAR 8. Cockos Reaper Updated to v2.54 Cockos has updated all versions of Reaper to v2.54 (Win32, Win x64 Beta and Mac Beta).